JAL will bring back AIR YOSHINOYA for the 5th time! Image by Japan Airlines. If I have to guess which of the AIR SERIES dishes is the most popular one, AIR YOSHINOYA will definitely but my first guess. 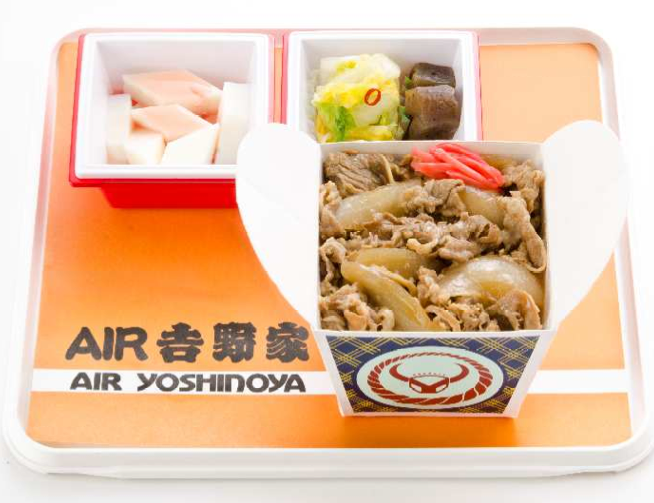 No other dishes in the popular AIR SERIES has been served as much as AIR YOSHINOYA did and it has just made another record by returning to the inflight menu for the 5th time! This time passengers on Japan Airlines (JAL) flights from Los Angeles, San Diego, and San Francisco will be able to enjoy the treat. As usual, this will be served as the second meal upon arrival in Premium Economy and Economy Class. But this time, First Class and Business Class passengers will also be able to order this from the Anytime You Wish a la carte menu, which is served after the first meal service. The same JAL original container will be used. Inside, you will find the same high quality of beef with the optimal balance of fat with extra sauce to accommodate the low humidity in the cabin. Of course, thanks to the special container design, you can either enjoy the AIR YOSHINOYA as a beef bowl or beef plate. This will be available between December 1 2013 and February 28 2014.